Since this article was published, a major accident at the Baikonur Cosmodrome at the beginning of July has delayed the launch of Astra 2E for several months. SES has announced that the next satellite to be launched to provide satellite TV and radio to the UK and Ireland has safely arrived at the Baikonur Cosmodrome in Kazakhstan. Astra 2E - confusingly being launched a year after Astra 2F - is expected to launch on the 21st July from the Cosmodrome and enter full service at 28 degrees East following the completion of tests which are expected during August. 28 degrees East is the orbital position for UK TV services on the Sky and/or Freesat platforms. 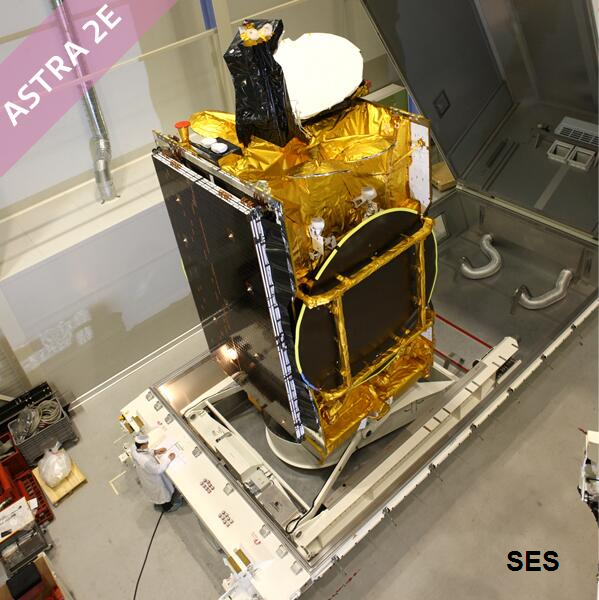 2E was built for SES by Astrium of France. According to the satellite operator, "the spacecraft will carry 60 Ku-band transponders, as well as 3 wideband Ka-band transponders. It will have a launch mass of 6 tonnes, a wingspan of 40m once its solar arrays are deployed in orbit, and a spacecraft power of 13kW at the end of its 15-year design lifetime. "2E will be the seventh Eurostar satellite in the SES fleet, following the successful launch of SES-6 in June 2013 and Astra 2F in September 2012." Services currently on Astra 1N - including many BBC, itv and Channel 4 services, are expected to migrate across to Astra 2E, with Astra 1N expected to move to serve continental Europe from 19.2 degrees East. Viewers in the UK and Ireland will not be affected by the transfer, however the satellite transfer is expected to further reduce the area outside of the British Isles where UK TV can be received in full. Sister satellite Astra 2F already caused some viewers in the Mediterranean and Central Europe to lose access to Channel 5 and some BBC high definition services due to its tighter beam on the British Isles. The full impact will only become apparent once the first services migrate later this year.